Authentic taste and aroma of fish. Consistent taste and quality helps to deliver the same fish filling taste every time. Diverse application for seasonings, stocks,soups, sauces and other savory dishes. May Contain traces of cereals containing gluten, fish, crustacean, soy, egg, milk, mollusc ,peanut and tree nuts. Best solution to get real fish taste. Made from real fish for an intense fish flavour. 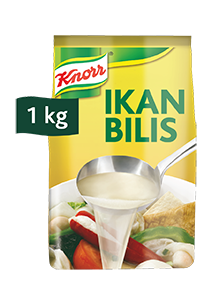 • Dissolve 24g (2 heaped tablespoons) of Knorr Ikan Bilis seasoning powder in 1 litre of boiling water. • Diverse applications for seasonings, stocks, soups sauces and other savory dishes. Ambient (Store in a cool and dry place, away from direct sunlight, After opening, fold the bag to keep balance of content fresh). • Great product to sprinkle over any seafood rice dish. • Sprinkle or Mix the Ikan powder at the last minute to maintain the fresh fish aroma.